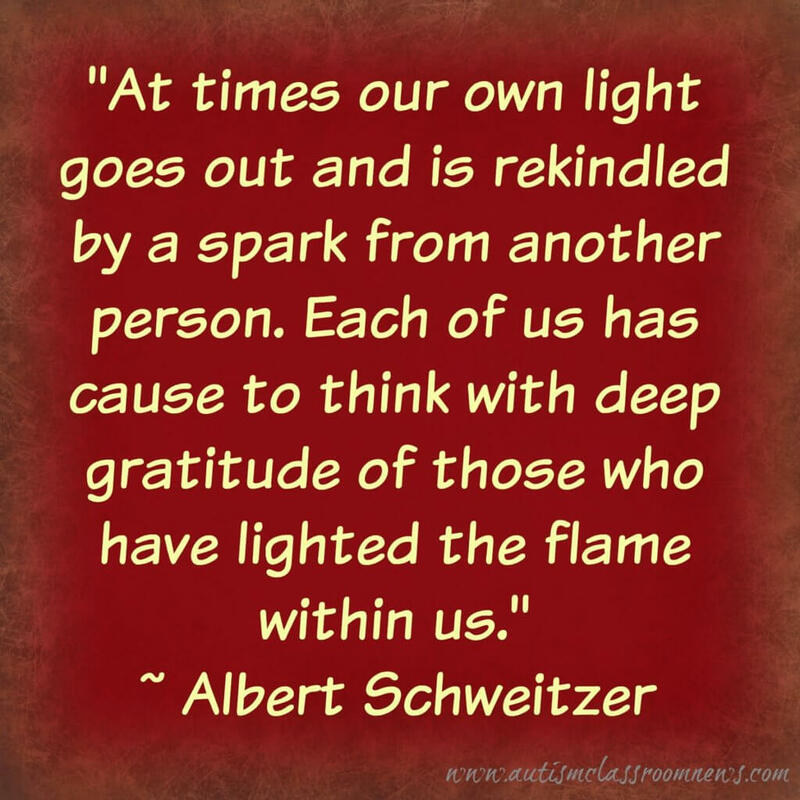 Those of you who follow me on Facebook may have seen this quote on my page earlier this week with a note about how thankful I am for my mentor, Edward (Ted) Carr. 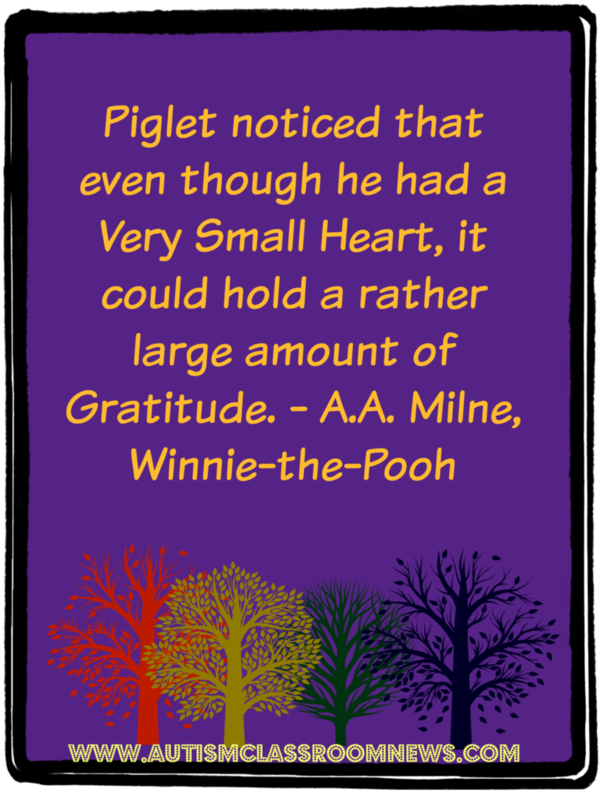 When I posted that I intended it to be a daily quote through Thanksgiving with notes about things I am thankful for. However, I wasn’t that successful with that, so I wanted to leave you for Thanksgiving with some thoughts about things I am thankful for, including this community. I also have a few announcements at the end of the post (which I will do my best to keep brief). My life has been filled with meeting wonderful people through work, through family, through friendships and any combination of those. For many years, when the intranet was really just getting started, I was consulting in small rural towns where the person working with students with autism or significant disabilities was often the only teacher with that type of classroom at least in their school and sometimes in their town. In those days I started an intranet to try to connect those teachers and autism specialists with each other. It became a place for discussion and mostly a place for sharing resources. Some of you who follow me here may remember it. Unfortunately, the intranet company went out of business and it kind of broke up the group. One of things I am really thankful for this year is the opportunity to recreate this type of community through the blog and Facebook page. 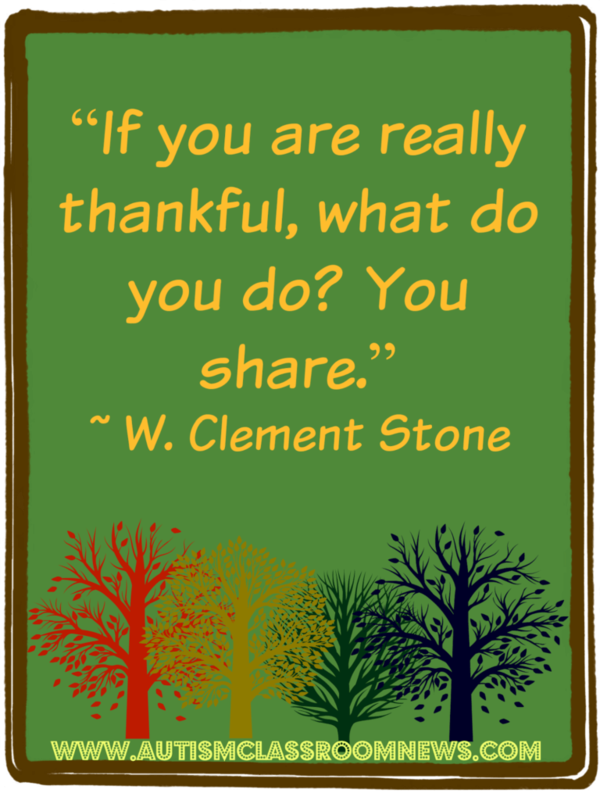 I am thankful for all that teachers do for their students and I am thankful to have the opportunity to get to know all of you, at least virtually. I am grateful to you for your work but I am also grateful to you for the time that you take to read what I share, to share what I write, to buy my products but mostly to see you support each other, share resources, and offer ideas and suggestions when someone needs assistance. There is so much work to do with our students and in our communities for people with autism and all disabilities that it will take a community to make that happen. Thank you for being part of the community–our small virtual one, our local communities, and our national and international ones. 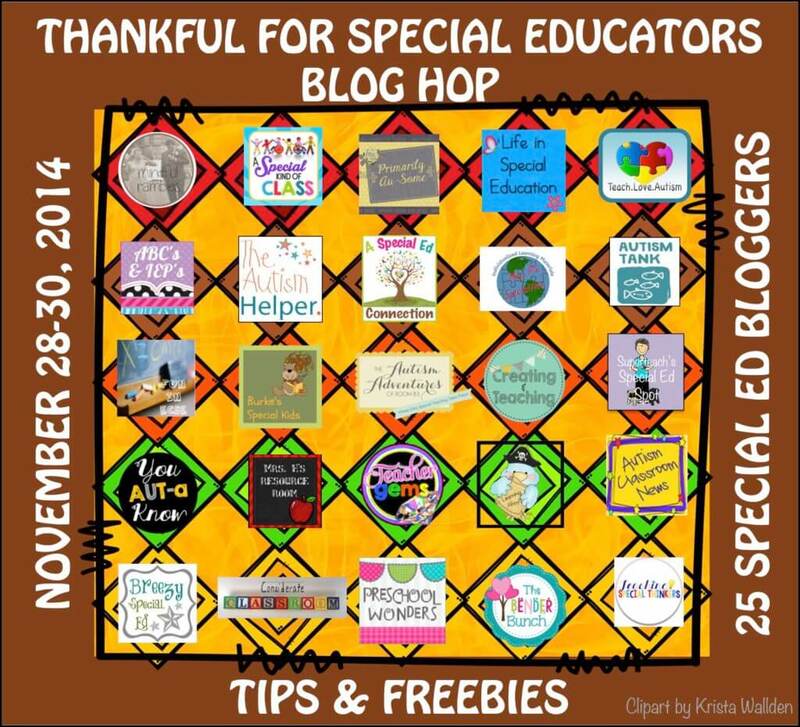 Part of that community includes a community of special education bloggers. Many of you have probably seen this graphic before, but on Friday, please come back for a hop of 25 blogs each with a tip for making life in the classroom easier in some way and a free activity to help get you started in the holiday rush after Thanksgiving break. It’s our way of showing our gratitude for your support. Also, come Monday, TPT is having a mega-sale and you can get 28% off of everything in my store on Monday and Tuesday with the promo code (never forget the promo code–I have). Just what you need to get you started for the end of the semester craziness that is the time between Thanksgiving and winter break. I hope to have my new food groups product completed in time for the sale and will share that if I do. So with the large amount of gratitude in My Very Small Heart, I will wish you a wonderful Thanksgiving. Enjoy the time off, the time with family or just the time to do something for yourself. Just make sure to stop by this weekend to pick up your freebie….I’ve thought of about 4 more so look for more freebies over the coming weeks as well. 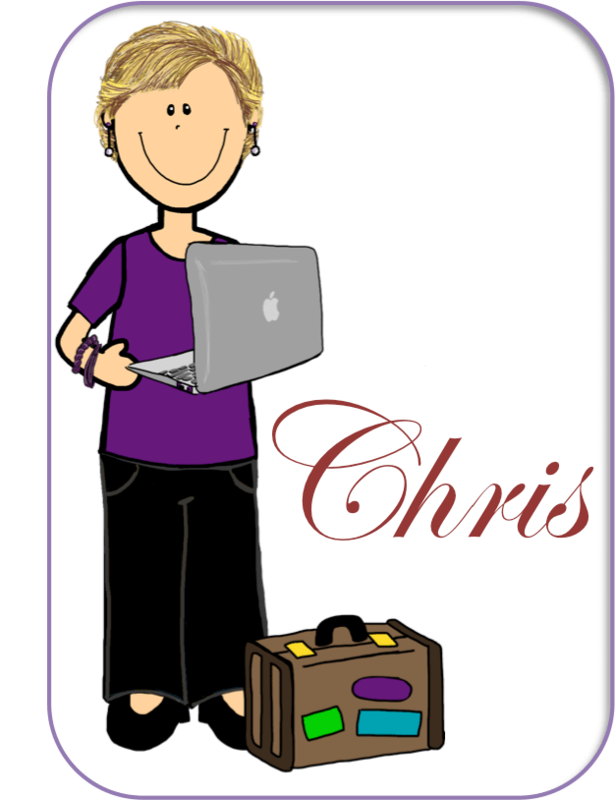 So thankful for your expertise in the field of autism, the resources your share, and most importantly the friendship that has come through blogging!